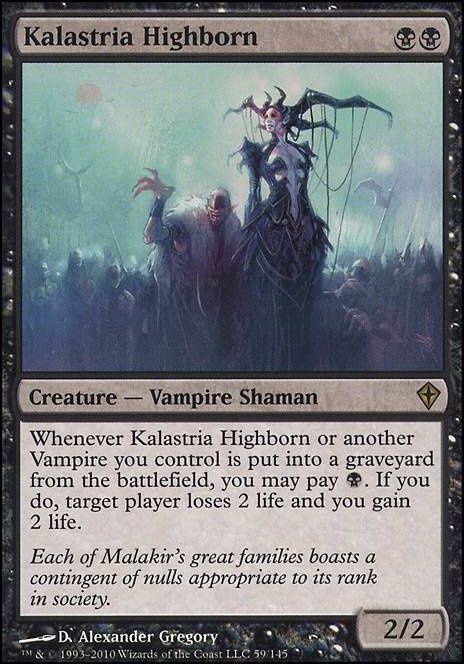 Whenever Kalastria Highborn or another Vampire you control is put into a graveyard from the battlefield, you may pay . If you do, target player loses 2 life and you gain 2 life. Hey, nice upgrade of the precon, but you need more Vamps, less of all the other stuff :) Good job cutting Powerstone for Lantern, that was the right choice since your deck is three colors. 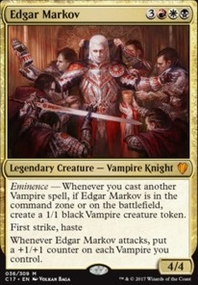 Edgar's eminence is a major reason to play him as a Commander and to take more advantage of eminence consider more low CMC Vamps? One drops, two drops and a couple of three drops? The idea is to have more opportunities to play Vamps in the early game which then in return gives you more Vamps on the battlefield because each Vamp you cast gives you a 1/1 Vamp token. You already have your high CMC Vamp to play, six drop Edgar from the Command Zone therefore you don't need a lot of other high CMC creatures. Instead cut back on the high CMC Vamps five CMC or higher for lower CMC Vamps make it easier to have more Vamps on the battlefield which in return makes Edgar's ability better, to have more Vamps to add counters too. If you like some of these suggestions I offer help to make cuts. 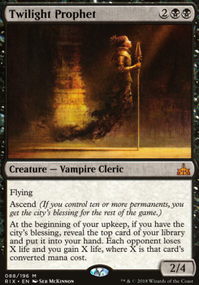 Shared Animosity and Bloodline Keeper Flip are two expensive price, but powerful cards with Vamps and Edgar. 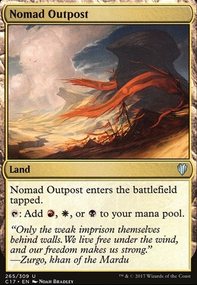 These can replace lands here that ETB (enter the battlefield) tapped such as Orzhov Guildgate, Boros Guildgate, Akoum Refuge, etc. Really not a fan of Resourceful Return when you have this few artifacts. I also think you should cut a bit down an the sheer volume of your lategame combo. With this many pieces it could easily end up clogging up your game-plan early on, leading to a loss before you get properly set up. Meybe get those Gifted Aetherborn to a 4-of, and get a few Kalastria Highborn , maybe even get a Kalitas, Traitor of Ghet . Also, Inquisition of Kozilek and/or Thoughtseize are key to beating combo decks. Hi! Just some ideas. Nykthos, Shrine to Nyx for mana base. Phyrexian Arena for card draw. Erebos, God of the Dead - indestructible card draw. 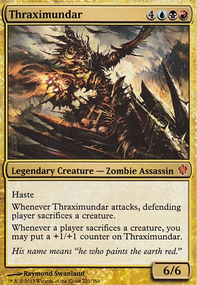 Dictate of Erebos - great combo: Yahenni, Undying Partisan/Kalitas, Traitor of Ghet + Bloodghast + Blood Artist/Kalastria Highborn. Vraska's Contempt - a very promising removal. Metallic Mimic, Adaptive Automaton, Bad Moon or Vanquisher's Banner to boost your creatures. It looks pretty good, though I'd like to see some Kalastria Highborn in the sb. Aggro tribal decks like vampires and merfolk work much better with a lower curve imo, besides the occasional really strong cards like Vampire Nocturnus and Master of Waves that warrant some spots in the deck. 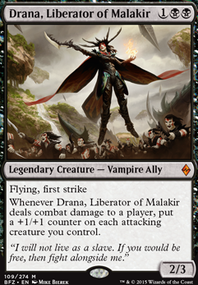 The only one of these that I think you really need is Legion Lieutenant, but Kalastria Highborn can be good in the sideboard as a counter to sweepers (it's probably better than Oathsworn Vampire at least), and the two one-drops are both better than Vampire Cutthroat here imo. Other than that I think you should at least run a 2/2 split of Fatal Push and Path, just because Push is a black card and Path isn't. you definitely need the 4th Bloodghast, you should cut the Vampire Lacerator as it is too low impact and Dusk Legion Zealot does not seem particularly good unless you are going wide. Suggest Viscera Seer for blanking removal+fixing your draw+combo with Bloodghast+combo with Kalastria Highborn. And if you are playing 4 Fatal Push, you'd want some number of fetches. You can also fit Mutavault in as an honorary vampire. 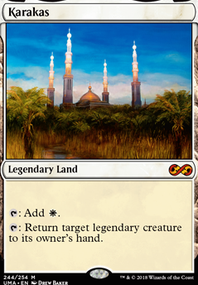 Since you have access to white, you'd want powerhouse sideboard cards such as Stony Silence. nice, got a few good ideas for my deck from yours. 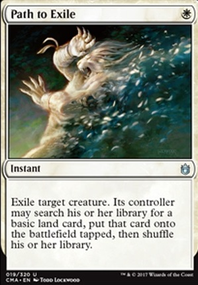 i would probably consider removing Moment of Triumph, Righteousness, Urge to Feed, Orzhov Keyrune and instead consider Blood Artist, Exquisite Blood (if possible, it's expensive), Suffer the Past, Sorin, Lord of Innistrad, Kalastria Highborn. most of them are from your maybeboard.